It is nice to get Christmas cards with stickers & other goodies inside, but by the time you get them it's too late to use for the year so....how about we send out Christmas cards with goodies inside that we can use for the next big upcoming holiday...Valentine's Day! Now you can have those stickers on hand to decorate your V-Day envelopes...that ephemera that someone sent you to make some V-Day art or a cute little V-Day note card to send to someone you love. For this swap you will have 3 partners. You will send each partner a full size 5" x 7" or larger Christmas card that includes the swap name, your user name & a nice greeting written or printed out inside. You will also include a flat, Valentine's Day surprise inside of your cards. Examples would be...stickers, washi tape, tags, notecard, ephemera, postcards, etc. 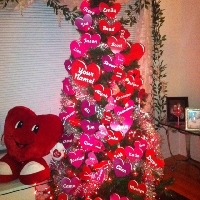 Have a very merry Christmas & a happy Valentine's Day too! RULES: No recent or unexplained 1's or 3's. Must have a good swapping history & a well filled out profile. I will screen all participants of this swap during signup & before partners are assigned, so don't drop out if you see a flaker or someone with poor ratings because they will be removed. If your not sure if you meet the requirements, have a concern about the swap or about someone who has signed up please let me know privately. What a great swap idea! I love including both the current holiday and a future one! I have my cards and goodies set to go! @jannieb can the cards be handmade or do they need to be store bought? @jannieb Would 6.5 x 5 inches be okay? I’d like to make some cards and have blank card bases and that’s the size they are.